Dotco 12R91 Series Precision Governed Turbine Grinders requires no air line lubrication. Dotco 12R91 Series Precision Governed Turbine Grinders feature high precision ball bearings for long life expectancy and maximizes productivity with a two-stage turbine motor. Dotco 12R91 Series Precision Governed Turbine Grinders can achieve a superb finish with its high speed and precision spindle. 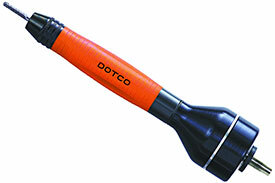 Dotco 12R91 Series Precision Governed Turbine Grinders are light weight and have a durable aluminum housing. Dotco 12R91 Series Precision Governed Turbine Grinders feature low vibration and quiet operation that minimizes operator fatigue. The 12R9180-03 Dotco 12R91 Series Precision Governed Turbine Grinder, 3mm Collet is one of thousands of quality tooling products available from MRO Tools. Please browse Dotco 12R91 Series Precision Governed Turbine Grinders for tools similar to the 12R9180-03 Dotco 12R91 Series Precision Governed Turbine Grinder, 3mm Collet. 12R9180-03 Dotco 12R91 Series Precision Governed Turbine Grinder, 3mm Collet description summary: Dotco 12R91 Series Precision Governed Turbine Grinders Collet Size: 3mm Free Speed (rpm): 65,000 Overhose: None Abrasive Capacity: 1/8'' Carbide Burr/3/8'' Diamond Pin Type Housing: Composite Air Inlet Size: 1/8'' Quantity discounts may be available for the 12R9180-03 Dotco 12R91 Series Precision Governed Turbine Grinder, 3mm Collet. Please contact MRO Tools for details.